Moscow ( Français: Moscou, Spanish: Moscú, Deutsch: Moskau, Русский: Москва) - (The) city in Russia, situated in Moscow region. According to the latest census, the city population is 10381222. Geographical coordinates of Moscow (WGS84): latitude: 55° 45' 21" N ( 55.7558 ), longitude: 37° 37' 3" E ( 37.6176 ). We recommend you to visit the following pages about travelling to Moscow: Interactive map of Moscow. The most popular sights and events are: Eurovision Song Contest 2009, KGB, Moscow Metro, Red Square, Moscow Kremlin, Lomonosov Moscow State University, Saint Basils Cathedral, Bolshoi Theatre, Luzhniki Stadium, Lenins Mausoleum, Ostankino Tower, Tretyakov Gallery, Cathedral of Christ the Saviour, Russian Academy of Sciences, Tsar Bell and El Lissitzky. Your trip will be even more exciting if you include following cities journey to Verkhovazhye on your route . 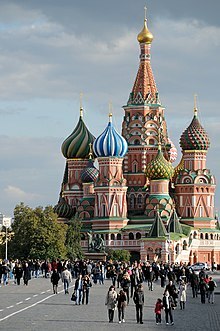 Wikipedia about Moscow: Moscow on our wiki pages. Clockwise from top right: Spasskaya Tower of the Moscow Kremlin; MIBC; Red Square, Saint Basil's Cathedral; Bolshoi Theatre; Moscow State University; and Cathedral of Christ the Saviour. Moscow is situated on the Moskva River in the Central Federal District of European Russia, making it Europe's most populated inland city. The city is well known for its architecture, particularly its historic buildings such as Saint Basil's Cathedral with its colourful architectural style. With over 40 percent of its territory covered by greenery, it is one of the greenest capitals and major cities in Europe and the world, having the largest forest in an urban area within its borders—more than any other major city—even before its expansion in 2012.The city has served as the capital of a progression of states, from the medieval Grand Duchy of Moscow and the subsequent Tsardom of Russia to the Russian Empire to the Soviet Union and the contemporary Russian Federation. Moscow is the seat of power of the Government of Russia, being the site of the Moscow Kremlin, a medieval city-fortress that is today the residence for work of the President of Russia. The Moscow Kremlin and Red Square are also one of several World Heritage Sites in the city. Both chambers of the Russian parliament (the State Duma and the Federation Council) also sit in the city. Moscow is considered the centre of Russian culture, having served as the home of Russian artists, scientists and sports figures and because of the presence of museums, academic and political institutions and theatres. The city is served by a transit network, which includes four international airports, nine railway terminals, numerous trams, a monorail system and one of the deepest underground rapid transit systems in the world, the Moscow Metro, the fourth-largest in the world and largest outside Asia in terms of passenger numbers, and the busiest in Europe. It is recognised as one of the city's landmarks due to the rich architecture of its 200 stations. Moscow has acquired a number of epithets, most referring to its size and preeminent status within the nation: The Third Rome (Третий Рим), The Whitestone One (Белокаменная), The First Throne (Первопрестольная), The Forty Forties (Сорок Сороков) (The Forty Soroks, "sorok" translates as forty, but here it is old name of district or parish, and "forty" in old Russian means not 40, but "great many"). Moscow is one of the twelve Hero Cities. In old Russian the word "Сорок" (forty) also meant a church administrative district, which consisted of about forty churches. The demonym for a Moscow resident is "москвич" (moskvich) for male or "москвичка" (moskvichka) for female, rendered in English as Muscovite. The name of the city is thought to be derived from the name of the Moskva River.Finno-Ugric Merya, East Slavic and Muroma people, who were among the tribes which originally inhabited the area, called the river Mustajoki. It has been suggested that the name of the city derives from this term. However, there have been proposed several theories of the origin of the name of the river. The most linguistically well-grounded and widely accepted is from the Proto-Balto-Slavic root *mŭzg-/muzg- from the Proto-Indo-European *meu- "wet", so the name Moskva might signify a river at a wetland or a marsh. Its cognates include Russian: музга, muzga "pool, puddle", Lithuanian: mazgoti and Latvian: mazgāt "to wash", Sanskrit: májjati "to drown", Latin: mergō "to dip, immerse". There exist as well similar place names in Poland like Mozgawa. However, the form Moskovĭ has left some traces in many other languages, such as English: Moscow, German: Moskau, French: Moscou, Latvian: Maskava, Ottoman Turkish: Moskov, Tatar: Мәскәү, Mäskäw, Kazakh: Мәскеу, Mäskew, Chuvash: Мускав, Muskav, etc. In a similar manner the Latin name Moscovia has been formed, later it became a colloquial name for Russia used in Western Europe in the 16th–17th centuries. From it as well came English Muscovy and muscovite. The earliest East Slavic tribes recorded as having expanded to the upper Volga in the 9th to 10th centuries are the Vyatichi and Krivichi.The Moskva River was incorporated as part of Kievan Rus into the Suzdal in the 11th century. By AD 1100, a minor settlement had appeared on the mouth of the Neglinnaya River. The first known reference to Moscow dates from 1147 as a meeting place of Yuri Dolgoruky and Sviatoslav Olgovich. At the time it was a minor town on the western border of Vladimir-Suzdal Principality. The timber fort na Moskvě "on the Moscow river" was inherited by Daniel, the youngest son of Alexander Nevsky, in the 1260s, at the time considered the least valuable of his father's possessions.Daniel was still a child at the time, and the big fort was governed by tiuns (deputies), appointed by Daniel's paternal uncle, Yaroslav of Tver. Daniel came of age in the 1270s and became involved in the power struggles of the principality with lasting success, siding with his brother Dmitry in his bid for the rule of Novgorod. From 1283 he acted as the ruler of an independent principality alongside Dmitry, who became Grand Duke of Vladimir.Daniel has been credited with founding the first Moscow monasteries, dedicated to the Lord's Epiphany and to Saint Daniel. Daniel I ruled Moscow as Grand Duke until 1303 and established it as a prosperous city that would eclipse its parent principality of Vladimir by the 1320s. 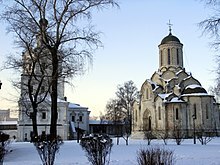 On the right bank of the Moskva River, at a distance of five miles (8.0 kilometres) from the Kremlin, not later than in 1282, Daniel founded the first monastery with the wooden church of St. Daniel-Stylite. Now it is the Danilov Monastery. Daniel died in 1303, at the age of 42. Before his death he became a monk and, according to his will, was buried in the cemetery of the St. Daniel Monastery. 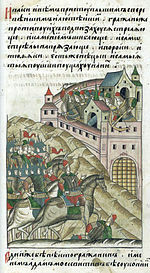 The Crimean Tatars attacked again in 1591, but this time were held back by new defence walls, built between 1584 and 1591 by a craftsman named Fyodor Kon. In 1592, an outer earth rampart with 50 towers was erected around the city, including an area on the right bank of the Moscow River. As an outermost line of defence, a chain of strongly fortified monasteries was established beyond the ramparts to the south and east, principally the Novodevichy Convent and Donskoy, Danilov, Simonov, Novospasskiy, and Andronikov monasteries, most of which now house museums. From its ramparts, the city became poetically known as Bielokamennaya, the "White-Walled". The limits of the city as marked by the ramparts built in 1592 are now marked by the Garden Ring. Three square gates existed on the eastern side of the Kremlin wall, which in the 17th century, were known as: Konstantino-Eleninsky, Spassky, Nikolsky (owing their names to the icons of Constantine and Helen, the Saviour and St. Nicholas that hung over them). The last two were directly opposite the Red Square, while the Konstantino-Elenensky gate was located behind Saint Basil's Cathedral. 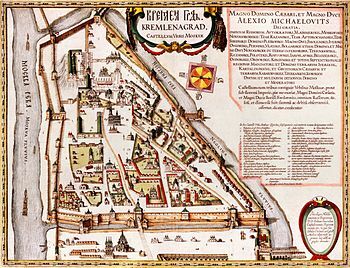 Sigizmundian Plan of Moscow, engraved in 1610, is the last city plan compiled (by the Poles) before the destruction of the city in 1612 and subsequent changes to the street network. Orientation: North is at the right, West at the top. (Moscovia urbs metropolis tutius Russiæ Albæ) - Moscow the metropolis of White Russia. Numerous disasters befell the city. The plague epidemics ravaged Moscow in 1570–1571, 1592 and 1654–1656. The plague killed upwards of 80% of the people in 1654–55. Fires burned out much of the wooden city in 1626 and 1648.In 1712 when Peter the Great moved his government to the newly built Saint Petersburg on the Baltic coast Moscow ceased to be Russia's capital except for a brief period from 1728 to 1732 under the influence of the Supreme Privy Council. After losing the status as capital of the empire, the population of Moscow at first decreased, from 200,000 in the 17th century to 130,000 in 1750. But after 1750, the population grew more than tenfold over the remaining duration of the Russian Empire, reaching 1.8 million by 1915. By 1700, the building of cobbled roads had begun. In November 1730, the permanent street light was introduced, and by 1867 many streets had a gaslight. In 1883, near the Prechistinskiye Gates, arc lamps were installed. In 1741 Moscow was surrounded by a barricade 25 miles (40 kilometres) long, the Kamer-Kollezhskiy barrier, with 16 gates at which customs tolls were collected. Its line is traced today by a number of streets called val (“ramparts”).Between 1781–1804 the Mytischinskiy water-pipe (the first in Russia) was built. In 1813, following the destruction of much of the city during French occupation, a Commission for the Construction of the City of Moscow was established. It launched a great program of rebuilding, including a partial replanning of the city-centre. Among many buildings constructed or reconstructed at this time were the Grand Kremlin Palace and the Kremlin Armoury, the Moscow University, the Moscow Manege (Riding School), and the Bolshoi Theatre. In 1903 the Moskvoretskaya water-supply was completed. When Napoleon invaded Russia in 1812, the Moscovites were evacuated. It is suspected that the Moscow fire was principally the effect of Russian sabotage. Napoleon’s Grande Armée was forced to retreat and was nearly annihilated by the devastating Russian winter and sporadic attacks by Russian military forces. As many as 400,000 of Napoleon's soldiers died during this time. When Catherine II came to power in 1762, the city's filth and smell of sewage was depicted by observers as a symptom of disorderly life styles of lower-class Russians recently arrived from the farms. Elites called for improving sanitation, which became part of Catherine's plans for increasing control over social life. National political and military successes from 1812 through 1855 calmed the critics and validated efforts to produce a more enlightened and stable society. There was less talk about the smell and the poor conditions of public health. However, in the wake of Russia's failures in the Crimean War in 1855–56, confidence in the ability of the state to maintain order in the slums eroded, and demands for improved public health put filth back on the agenda. Soviet poster, issued on the 800th anniversary of Moscow. The inscription reads: "Glory to you, invincible Moscow, beauty and pride of the Russian people". Following the success of the Russian Revolution of 1917, Vladimir Lenin, fearing possible foreign invasion, moved the capital from Saint Petersburg back to Moscow on March 5, 1918. The Kremlin once again became the seat of power and the political centre of the new state. During the Great Patriotic War, the Soviet State Committee of Defence and the General Staff of the Red Army were located in Moscow. In 1941, 16 divisions of the national volunteers (more than 160,000 people), 25 battalions (18,000 people) and 4 engineering regiments were formed among the Muscovites. In November 1941, German Army Group Centre was stopped at the outskirts of the city and then driven off in the course of the Battle of Moscow. Many factories were evacuated, together with much of the government, and from October 20 the city was declared to be in a state of siege. Its remaining inhabitants built and manned antitank defences, while the city was bombarded from the air. On May 1, 1944 a medal "For the defence of Moscow" and in 1947 another medal "In memory of the 800th anniversary of Moscow" were instituted. The city of Zelenograd was built in 1958 at 37 kilometres (23 miles) from the city centre to the north-west, along the Leningradskoye Shosse, and incorporated as one of Moscow's administrative okrugs. 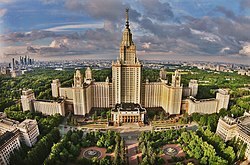 Moscow State University moved to its campus on Sparrow Hills in 1953. On May 8, 1965 due to the actual 20th anniversary of the victory in World War II Moscow was awarded a title of the Hero City. In 1980 it hosted the Summer Olympic Games. The MKAD (ring road) was opened in 1961. It had four lanes running 109 kilometres (68 miles) along the city borders. The MKAD marked the administrative boundaries of the city of Moscow until the 1980s, when outlying suburbs beyond the ring road began to be incorporated. In 1980, it hosted the Summer Olympic Games, which were boycotted by the United States and several other Western countries due to the Soviet Union's involvement in Afghanistan in late 1979. In 1991 Moscow was the scene of a coup attempt by conservative communists opposed to the liberal reforms of Mikhail Gorbachev. When the USSR was dissolved in the same year, Moscow remained the capital of the Russian SFSR (on December 25, 1991 the Russian SFSR was renamed the Russian Federation). Since then, a market economy has emerged in Moscow, producing an explosion of Western-style retailing, services, architecture, and lifestyles. The city has continued to grow during the 1990s to 2000s, its population rising from below nine to above ten million. Mason and Nigmatullina argue that Soviet-era urban-growth controls (before 1991) produced controlled and sustainable metropolitan development, typified by the greenbelt built in 1935. Since then, however, there has been a dramatic growth of low-density suburban sprawl, created by a heavy demand for single-family dwellings as opposed to crowded apartments. In 1995–1997 the MKAD ring road was widened from the initial four to ten lanes. In December 2002 Bulvar Dmitriya Donskogo became the first Moscow Metro station that opened beyond the limits of MKAD. The Third Ring Road, intermediate between the early 19th-century Garden Ring and the Soviet-era outer ring road, was completed in 2004. The greenbelt is becoming more and more fragmented, and satellite cities are appearing at the fringe. Summer dachas are being converted into year-round residences, and with the proliferation of automobiles there is heavy traffic congestion. Multiple old churches and other examples of architectural heritage that had been demolished during the Stalin era have been restored, such as Cathedral of Christ the Saviour.In 2010s Moscow's Administration has launched some long duration projects like the Moja Ulitsa (in English: My Street) urban redevelopment program or the Residency renovation one. Moscow serves as the reference point for the timezone used in most of European Russia, including Saint Petersburg, Belarus, and the Republic of Crimea. The areas operate in what is referred to in international standards as Moscow Standard Time (MSK, мск), which is 3 hours ahead of UTC, or UTC+3. Daylight saving time is no longer observed. According to the geographical longitude the average solar noon in Moscow occurs at 12:30. The highest temperature ever recorded was 38.2 °C (100.8 °F) at the VVC weather station and 39.0 °C (102.2 °F) in the center of Moscow and Domodedovo airport on July 29, 2010 during the unusual 2010 Northern Hemisphere summer heat waves. Record high temperatures were recorded for January, March, April, May, July, August, November and December in 2007–2014. The average July temperature from 1981–2010 is 19.2 °C (66.6 °F). The lowest ever recorded temperature was −42.1 °C (−43.8 °F) in January 1940. Snow, which is present for about five months a year, often begins to fall mid October, while snow cover lies in November and melts in the beginning of April. Christianity is the predominant religion in the city, of which the Russian Orthodox Church is the most popular. Moscow is Russia's capital of Eastern Orthodox Christianity, which has been the country’s traditional religion and was deemed a part of Russia's "historical heritage" in a law passed in 1997. 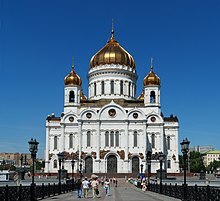 Other religions practiced in Moscow include Armenian Apostolicism, Buddhism, Hinduism, Catholicism, Islam, Judaism, Yazidism, Old Believers, Protestantism, and Rodnovery. The Patriarch of Moscow serves as the head of the church and resides in the Danilov Monastery. Moscow was called the "city of 40 times 40 churches"—"город сорока сороков церквей"—prior to 1917. In 1918 the Bolshevik government declared Russia a secular state, which in practice meant that religion was repressed and society was to become atheistic. During the period of 1920-1930s a great number of churches in Moscow were demolished, including historical Chudov Monastery in the Kremlin, dating from the 14th century, Kazansky Cathedral on the Red Square, the Cathedral of Christ the Savior, constructed in the 19th century in memory of a victory over Napoleon's army in 1812, and many more. This continued even after the Second World War, in 1940-1970s, when persecutions against religion in the Soviet Union became less severe. Most of the surviving churches and monasteries were closed and then used as clubs, offices, factories or even warehouses. 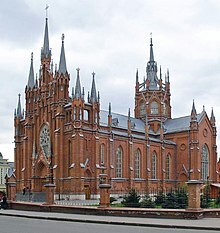 Since the disintegration of the Soviet Union in 1991 many of the destroyed churches have been restored and traditional religions are once again gaining popularity. Among the churches reconstructed in the 1990s is an impressive new Cathedral of Christ the Savior that once more has become a landmark. It was built on the site of the old demolished cathedral, where there had been a huge open swimming-pool until 1994.The Moscow mufti council claimed that Muslims numbered around 1.5 million of 10.5 millions of the city's population in 2010. There are four mosques in the city. Moscow Cathedral Mosque has been built at the site of the former one. It was officially inaugurated on September 23, 2015. The new mosque has the capacity of ten thousand worshippers. President of Russia Vladimir Putin, President of Turkey Recep Tayyip Erdoğan, President of the State of Palestine Mahmoud Abbas and local Muslim leaders participated in the inauguration ceremony of this mosque. Moscow's architecture is world-renowned. Moscow is the site of Saint Basil’s Cathedral, with its elegant onion domes, as well as the Cathedral of Christ the Savior and the Seven Sisters. The first Kremlin was built in the middle of the 12th century. The Kremlin was rebuilt in the 15th century. Its towers and some of its churches were built by Italian architects, lending the city some of the aura of the renaissance. From the end of the 15th century, the city was embellished by masonry structures such as monasteries, palaces, walls, towers, and churches. The city's appearance had not changed much by the 18th century. Houses were made of pine and spruce logs, with shingled roofs plastered with sod or covered by birch bark. 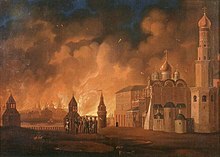 The rebuilding of Moscow in the second half of the 18th century was necessitated not only by constant fires, but also the needs of the nobility. Much of the wooden city was replaced by buildings in the classical style. Stalinist-era buildings, mostly found in the central part of the city, are massive and usually ornamented with Socialist realism motifs that imitate classical themes. However, small churches – almost always Eastern Orthodox– found across the city provide glimpses of its past. 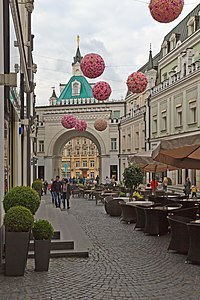 The Old Arbat Street, a tourist street that was once the heart of a bohemian area, preserves most of its buildings from prior to the 20th century. Many buildings found off the main streets of the inner city (behind the Stalinist façades of Tverskaya Street, for example) are also examples of bourgeois architecture typical of Tsarist times. Ostankino Palace, Kuskovo, Uzkoye and other large estates just outside Moscow originally belong to nobles from the Tsarist era, and some convents and monasteries, both inside and outside the city, are open to Muscovites and tourists. Attempts are being made to restore many of the city’s best-kept examples of pre-Soviet architecture. These restored structures are easily spotted by their bright new colors and spotless façades. There are a few examples of notable, early Soviet avant-garde work too, such as the house of the architect Konstantin Melnikov in the Arbat area. Many of these restorations were criticized for alleged disrespect of historical authenticity. Facadism is also widely practiced. Later examples of interesting Soviet architecture are usually marked by their impressive size and the semi-Modernist styles employed, such as with the Novy Arbat project, familiarly known as "false teeth of Moscow" and notorious for the wide-scale disruption of a historic area in central Moscow involved in the project. Moscow's skyline is quickly modernizing with several new towers under construction.In recent years, the city administration has been widely criticized for heavy destruction that has affected many historical buildings. As much as a third of historic Moscow has been destroyed in the past few years to make space for luxury apartments and hotels. Other historical buildings, including such landmarks as the 1930 Moskva hotel and the 1913 department store Voyentorg, have been razed and reconstructed anew, with the inevitable loss of historical value. Critics blame the government for not enforcing conservation laws: in the last 12 years more than 50 buildings with monument status were torn down, several of those dating back to the 17th century. Some critics also wonder if the money used for the reconstruction of razed buildings could not be used for the renovation of decaying structures, which include many works by architect Konstantin Melnikov and Mayakovskaya metro station. Tsytsin Main Botanical Garden of Academy of Sciences, founded in 1945 is the largest in Europe. It covers territory of 3.61 square kilometres (1.39 sq mi) bordering the All-Russia Exhibition Center and contains a live exhibition of more than 20 thousand species of plants from around the world, as well as a lab for scientific research. It contains a rosarium with 20 thousand rose bushes, a dendrarium, and an oak forest, with the average age of trees exceeding 100 years. There is a greenhouse taking up more than 5,000 square metres (53,820 square feet) of land. The All-Russian Exhibition Center (Всероссийский выставочный центр), formerly known as the All-Union Agricultural Exhibition (VSKhV) and later Exhibition of Achievements of the National Economy (VDNKh), though officially named a "permanent trade show", is one of the most prominent examples of Stalinist-era monumental architecture. Among the large spans of recreational park areas are scores of elaborate pavilions, each representing either a branch of Soviet industry and science or a USSR republic. Even though during the 1990s it was, and for some part still is, misused as a gigantic shopping center (most of the pavilions are rented out for small businesses), it still retains the bulk of its architectural landmarks, including two monumental fountains (Stone Flower and Friendship of Nations) and a 360 degrees panoramic cinema. In 2014 the park returned to the name Exhibition of Achievements of National Economy, and in the same year huge renovation works had been started.Lilac Park, founded in 1958, has a permanent sculpture display and a large rosarium. September 10, 2016, Moscow Central Circle renovated railroad (former Moskovskaya Okruzhnaya Zheleznaya Doroga) was introduced as 14th line of Moscow Metro. The railroad itself was in use since 1907, but before the renovation it was a non-electrified railroad for transit needs of fueled locomotives only. 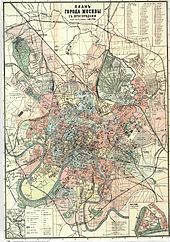 The outermost ring within Moscow is the Moscow Ring Road (often called MKAD, acronym word for Russian Московская Кольцевая Автомобильная Дорога), which forms the cultural boundary of the city, was established in the 1950s. It is to note the method of building the road (usage of ground elevation instead of concreete columns throughout the whole way) formed a wall-like barrier that obstacles building roads under the MKAD highway itself). Outside Moscow, some of the roads encompassing the city continue to follow this circular pattern seen inside city limits, with notable example of Betonka road, originally made of concrete pads. The State Historical Museum of Russia (Государственный Исторический музей) is a museum of Russian history located between Red Square and Manege Square in Moscow. Its exhibitions range from relics of the prehistoric tribes inhabiting present-day Russia, through priceless artworks acquired by members of the Romanov dynasty. The total number of objects in the museum's collection numbers is several million. The Polytechnical Museum, founded in 1872 is the largest technical museum in Russia, offering a wide array of historical inventions and technological achievements, including humanoid automata from the 18th century and the first Soviet computers. Its collection contains more than 160,000 items. The Borodino Panorama museum located on Kutuzov Avenue provides an opportunity for visitors to experience being on a battlefield with a 360° diorama. It is a part of the large historical memorial commemorating the victory in the Patriotic War of 1812 over Napoleon’s army, that includes also the triumphal arch, erected in 1827. There is also a military history museum that includes statues, and military hardware. Moscow is the heart of the Russian performing arts, including ballet and film, with 68 museums 103 theaters, 132 cinemas and 24 concert halls. Among Moscow’s theaters and ballet studios is the Bolshoi Theatre and the Malyi Theatre as well as Vakhtangov Theatre and Moscow Art Theatre. Slava Moscow is a professional rugby club, competing in the national Professional Rugby League. Former rugby league heavyweights RC Lokomotiv have entered the same league as of 2011. The Luzhniki Stadium also hosted the 2013 Rugby World Cup Sevens. Two of Moscow's stadiums will serve as venues for the FIFA World Cup games: the Luzhniki Stadium and the Otkritie Arena. The city is full of clubs, restaurants and bars. Tverskaya Street is also one of the busiest shopping streets in Moscow. Moscow is designated as one of three federal cities of Russia – the others being Saint Petersburg and Sevastopol (although the status of the latter is disputed). Among the 85 federal subjects of Russia, Moscow represents the most populated one and the second-smallest one in terms of area. Moscow is located within the central economic region, one of twelve regions within Russia with similar economic goals. The basic law of the city is the Charter of Moscow that was adopted in 1995. 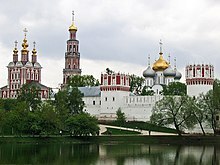 The Russian capital's town-planning development began to show as early as the 12th century, when the city was founded. The central part of Moscow grew by consolidating with suburbs in line with medieval principles of urban development, when strong fortress walls would gradually spread along the circle streets of adjacent new settlements. The first circular defence walls set the trajectory of Moscow's rings, laying the groundwork for the future planning of the Russian capital. Moscow has the lowest unemployment rate of all federal subjects of Russia, standing at just 1% in 2010, compared to the national average of 7%. The average gross monthly wage in the city is ₽60,000 ($2,700 in Purchasing Power), which is almost twice the national average of ₽34,000 ($1,500 in Purchasing Power), and the highest among the federal subjects of Russia. Moscow is the financial center of Russia and home to the country's largest banks and many of its largest companies, such as natural gas giant Gazprom. Moscow accounts for 17% of retail sales in Russia and for 13% of all construction activity in the country. Since the 1998 Russian financial crisis, business sectors in Moscow have shown exponential rates of growth. Many new business centers and office buildings have been built in recent years, but Moscow still experiences shortages in office space. As a result, many former industrial and research facilities are being reconstructed to become suitable for office use. Overall, economic stability has improved in recent years; nonetheless, crime and corruption continue still hinder business development. In 2008, Moscow had 74 billionaires with an average wealth of $5.9 billion, which placed it above New York's 71 billionaires. However, as of 2009, there were 27 billionaires in Moscow compared with New York's 55 billionaires. Overall, Russia lost 52 billionaires during the recession. Topping the list of Russia's billionaires in 2009 is Mikhail Prokhorov with $9.5 billion, ahead of the more famous Roman Abramovich with $8.5 billion, in 2nd place. Prokhorov's holding company, "ОНЭКСИМ" (ONÈKSIM) group, owns huge assets in hydrogen energy, nanotechnology, traditional energy, precious metals sector, while Abramovich, since selling his oil company Sibneft to Russian state-controlled gas giant Gazprom in 2005, has bought up steel and mining assets. He also owns Chelsea F.C.. Russia's richest woman remains Yelena Baturina, the 50-year-old second wife of Moscow Mayor Yuri Luzhkov. Oleg Deripaska, the 1st on this list in 2008 with $28 billion, was only 10th in 2009 with $3.5 billion. Based on Forbes' 2011 list of the world's billionaires, Moscow is the city with the most billionaires in the world, with 79 from 115 in all of Russia. In 2018, Moscow will be a host city to 12 games of the FIFA World Cup. The tournament will serve as an additional driver for the city economy, its sports and tourist infrastructure, and for land improvement in the city. Gazprom, the largest extractor of natural gas in the world and the largest Russian company, has head offices also in Moscow, as well as other oil, gas and electricity companies. Moscow is one of the financial centers of the Russian Federation and CIS countries and is known for its business schools. Among them are the Finance Academy under the Government of RF; Plekhanov Russian University of Economics; The State University of Management, and the State University - Higher School of Economics. They offer undergraduate degrees in management, finance, accounting, marketing, real estate and economic theory, as well as Masters programs and MBAs.Most of them have branches in other regions of Russia and countries around the world. The Gerasimov All-Russian State Institute of Cinematography, abbreviated as VGIK, is the world's oldest educational institution in Cinematography, founded by Vladimir Gardin in 1919.Sergei Eisenstein, Vsevolod Pudovkin, and Aleksey Batalov were among its most distinguished professors and Mikhail Vartanov, Sergei Parajanov, Andrei Tarkovsky, Nikita Mikhalkov, Eldar Ryazanov, Alexander Sokurov, Yuriy Norshteyn, Aleksandr Petrov, Vasily Shukshin, Konrad Wolf among graduates. Moscow State Institute of International Relations, founded in 1944, remains Russia's best- known school of international relations and diplomacy, with six schools focused on international relations. Approximately 4,500 students make up the university's student body and over 700,000 Russian and foreign-language books — of which 20,000 are considered rare — can be found in the library of the Moscow State Institute of International Relations. Although Moscow has a number of famous Soviet-era higher educational institutions, most of which are more oriented towards engineering or the fundamental sciences, in recent years Moscow has seen a growth in the number of commercial and private institutions that offer classes in business and management. Many state institutions have expanded their education scope and introduced new courses or departments. Institutions in Moscow, as well as the rest of post-Soviet Russia, have begun to offer new international certificates and postgraduate degrees, including the Master of Business Administration. Student exchange programs with different (especially, European) countries have also become widespread in Moscow's universities, while schools within the Russian capital also offer seminars, lectures and courses for corporate employees and businessmen. Sheremetyevo International Airport is the most common entry point for foreign visitors, handling 60% of all international flights. It is also a home to all SkyTeam members, and the main hub for Aeroflot (itself a member of SkyTeam). Domodedovo International Airport is the leading airport in Russia in terms of passenger throughput, and is the primary gateway to long-haul domestic and CIS destinations and its international traffic rivals Sheremetyevo. Most of Star Alliance members use Domodedovo as their international hub. Vnukovo International Airport handles flights of Turkish Airlines, Lufthansa, Wizz Air and others. Ostafyevo International Airport caters primarily to business aviation. The terminals are located close to the city center, along the metro ringline 5 or close to it, and connect to a metroline to the centre of town. Each station handles trains from different parts of Europe and Asia. There are many smaller railway stations in Moscow. As train tickets are cheap, they are the preferred mode of travelling for Russians, especially when departing to Saint Petersburg, Russia's second-largest city. Moscow is the western terminus of the Trans-Siberian Railway, which traverses nearly 9,300 kilometres (5,800 mi) of Russian territory to Vladivostok on the Pacific coast. 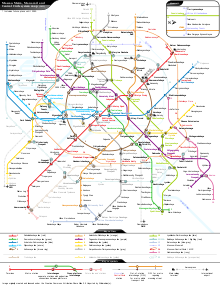 Today, the Moscow Metro comprises twelve lines, mostly underground with a total of 203 stations. The Metro is one of the deepest subway systems in the world; for instance the Park Pobedy station, completed in 2003, at 84 metres (276 ft) underground, has the longest escalators in Europe. The Moscow Metro is one of the world's busiest metro systems, serving about ten million passengers daily. (300,000,000 people every month) Facing serious transportation problems, Moscow has plans for expanding its Metro. In 2016, the authorities launched a new circle metro railway that contributed to solving transportation issues. It was built alongside of Little Ring of the Moscow Railway, taking some of its tracks into itself as well. As Metro stations outside the city center are far apart in comparison to other cities, up to 4 kilometres (2.5 mi), a bus network radiates from each station to the surrounding residential zones. Moscow has a bus terminal for long-range and intercity passenger buses (Central Bus Terminal) with daily turnover of about 25 thousand passengers serving about 40% of long-range bus routes in Moscow. With the total line length of almost 600 kilometres (370 miles) of single wire, 8 depots, 104 routes and 1740 vehicles, the Moscow trolleybus system was the largest in the world. But municipal authority, headed by Sergey Sobyanin, began to destroy trolleybus system in Moscow at 2014 due to corruption and planned replacement of trolleybuses by electrobuses. However, there is still no one trolleybus route replaced by electrobus, and a lot of former trolleybus routes, that was replaced by diesel buses. At 2018 Moscow trolleybus system have only 4 depots and dozens kilometers of unused wires. Almost all trolleybus wires inside Garden Ring (Sadovoe Koltso) was cut in 2016-2017 due to reconstruction of central streets ("Moya Ulitsa"). Opened on November 15, 1933 it is also the world's 6th oldest operating trolleybus system. Moscow has different vehicle sharing options that are sponsoed by the local government: there are several car sharing companies (Karshering) which are in charge of providing cars to the population. To drive the automobiles, the user has to book them through the app of the owning company. In 2018 the mayor Sergey Sobyanin said the Moscow's car sharing system has become the biggest in Europe in terms of vehicle fleet. Every day about 25,000 people use this service. Another sharing system is bike sharing (Velobike) of a fleet formed by 3000 traditional and electrical bicycles. The Delisamokat is a new sharing service that provides electrical scooters. There are companies that provide different vehicles to the population in proximity to Moscow's big parks. The Federation Tower, completed in 2016, is the tallest building in Europe. Also to be included in the project are a water park and other recreational facilities; business and entertainment complexes, office and residential buildings, the transport network and the new site of the Moscow government. The construction of four new metro stations in the territory has been completed, two of which have opened and two others are reserved for future metro lines crossing MIBC, some additional stations were planned. A rail shuttle service, directly connecting MIBC with the Sheremetyevo International Airport is also planned. Major thoroughfares through Moscow-City are the Third Ring and Kutuzovsky Prospekt. Three metro stations were initially planned for the Filyovskaya Line. The station Delovoi Tsentr opened in 2005, and was later renamed Vystavochnaya in 2009. The branch extended to the Mezhdunarodnaya station in 2006, and all work on third station, Dorogomilovskaya (between Kiyevskaya and Delovoi Tsentr), has been postponed. There are plans to extend the branch as far as the Savyolovskaya station, on the Serpukhovsko-Timiryazevskaya Line. Moscow is home to nearly all of Russia's nationwide television networks, radio stations, newspapers and magazines.